Just a wee note to say thanks again for teaching my children how to ceilidh. We were at a wedding on Saturday and Alexander was a star at progressive Circassian Circle - totally unfazed by moving partners and well able to keep up with the adults! This class is great! I go with my two children and Caroline always explains how to do each dance with two partners. 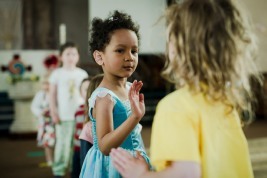 There's a good mix of dances we've done before and new ones so the children don't feel bored or over-stretched. Highly recommended. I have been taking my wee girl to CeilidhKids for a while now and the classes are great fun with a really welcoming atmosphere. We spend a happy 45 minutes each week twirling and skipping and dancing our socks off. Very good fun, but highly educational (counting, taking turns, watching, listening, etc, etc) too. And just when I thought it couldn't get any better, I went to pay and found out it was per family - not per child! Thank you so much for doing our party today. Everyone was saying how good it was and really enjoyed your organisation of the dances - it was perfect for our group of 4 year olds and, as someone commented, was a great change from a soft play party! Thank you for leading everyone so well and providing all the music, speakers, etc.. We couldn't have hoped for more. A big thank you for Madeleine's birthday party - she had such a good time and everyone has commented on how much their child enjoyed the dancing. The adults were all really impressed how they listened and followed your instructions - very easy to follow! Madeleine is still talking about it - we are inspired to do more dancing now ! Thank you, we had a terrific afternoon! I am so chuffed that my children both joined in - they have both been known to watch from the sidelines, so thank you for creating such a friendly and encouraging atmosphere. I just wanted to thank you again for a most enjoyable evening. Everyone seemed to really enjoy themselves and it was lovely to see so many families up on the floor. One red cheeked boy said to me as he was leaving ‘that was brilliant’ and I think that says it all. I like this even better than nursery! We had a great time... Duncan refusing to take his kilt off for the rest of the day! Fantastic bash - thoroughly fun for all and really accessible for all ages! Really swept the February blues away. We sang all the way home in a desperate attempt to keep R&L awake! Family Ceilidh last weekend at the Twins’ Club.. it really was a great way to start your weekend in a happy positive energetic way. 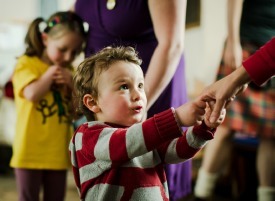 Just love CeilidhKids… had a CeilidhKids party for Maisie's 6th birthday and we all loved it. Aged from 3 months to 66 years! 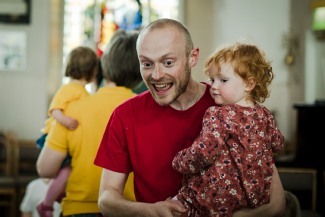 Just a quick note to say thank you so much for CeilidhKids since the summer. My two have absolutely loved every class… We went to a "grown up" ceilidh at the weekend and the girls were really following all the steps and recognising the patterns thanks to your tuition.